Every now and then, a strange thing happens in the world of books. Powerful, thought-provoking works go largely unnoticed, while moronic and juvenile scribbles hold the world captive. Truly, we have some twisted values. Here I’ll break the rules: I’ll talk about a book I’m currently reading; one which I haven’t finished yet. The reason I’ll dare such hubris is two-fold: First, I’ve almost finished it and second, it has shifted so much of my thinking, that it just can’t wait. 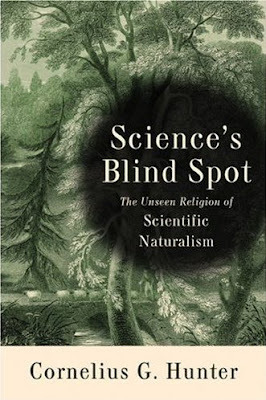 The book is Science’s Blind Spot: The Unseen Religion of Scientific Naturalism, by Cornelius G. Hunter. Hunter is a biophysicist, and is known for his previous books, Darwin’s God: Evolution and the Problem of Evil and Darwin’s Proof: The triumph of Religion over Science, both of which offer some of the most intelligent skepticism on the Theory of Evolution. There – after dancing around the subject, it finally appears openly on the Microscope. I’m a Christian. I’m also a biologist, actively working in research. There are people today who will consider both those roles mutually exclusive. I have seen fellow Christians wince as if I told them that I work for a drug cartel (well, I have worked in pharmaceutical industry, ha ha). And even though today there are many new pebbles that scar the smooth interface of Science and Religion (see stem cells, cloning, abortions, LHC, euthanasia), the question of how we all got here is still Hot Topic Number One. And rightly so, since that question determines the direction all the others will go: It’s not strange that Darwin’s Grand Idea is invoked at the very beginning of current debates on life, death and even “sexual preference” issues. It’s clear: if we are the lucky outcome of random mutations over a long period of time, then there is no Greater Morality over our heads except whatever we invent at any time to suit our particular purposes and preferences. But if we were indeed created according to the image of a Higher Person, then things are diametrically different. If God made us, then we ought to take that into serious consideration. It’s a vicious battle. And if you were hoping that in this post you’d find a quick “warrior’s manual” for either Creationism, Intelligent Design, Theistic Evolution or Naturalistic Evolution, I’m afraid I will have to sadly disappoint you. Maybe in the future – I’m always studying – but for now, all I can do is share some fruits from what I’ve been growing. There are a few things that I can point out with a degree of certainty. First, there has been a lot of damage done to the debate from both sides (Creationists vs Evolutionists, or the new fashion, Atheists vs Theists). Fair enough. It’s an emotional topic. Right or wrong, Religion is a HUGE aspect of mankind as we know it, and is deeply ingrained in our minds and cultures. We all agree with that, and we also agree that you can’t just pluck it out like a thorn in your shoe. But I don’t know if all that justifies the inimitable stupidity (I use that term with all its academic force) that is often displayed by many who engage this debate. A great example was the “Does God exist?” debate between the “Rational” “Response” Squad (atheists) and the Way of the Master Radio members (Christians) that took place in 2007 on prime-time US television (I wrote about it before). Most of what was on display from both sides could never qualify as “debate” (watch it for yourself on YouTube), but, in particular, the arguments for and against Evolution did no justice whatsoever to the Sapiens part of our species. Why? Because none of those debating had any proper understanding of Darwin’s theory – or if they did, they hid very well. And this is painfully frequent example of how this debate goes between people on both sides who really haven’t done their homework. Evolutionists are constantly trying to patch the holes in their hypotheses and models (as all good scientists should – that’s not the problem) and Creationists (mostly Christians) are still utilising regurgitated arguments from the ’70s. The point is not that it is not a reasonable argument (even Darwin had issues with it), but that, in the eyes of many scientists, it has been answered successfully and alternatives have been long suggested. Not to mention that the recent spotlight on the Tiktaalik fossil has actually revived the “intermediate species” view (which was, of course, previously doubted). In short, it seems to me as if most of the Creationist side seems to be constantly lagging a few years behind, or to not be up-to-date with trends in evolution theory. And that doesn’t help anyone. I know what you’re thinking: “So you’re saying that we are supposed to keep up with every trend in evolution theory?” Well, yes – if you want to debate a theory that is based on Science, make sure you first understand the science. Ignorant accusations, wild theorising and outright fanaticism does not get you heard. And I say that, openly, to BOTH sides. Now, there are many resources out there that cast skepticism on evolution, ranging from conservative Creationist (e.g. http://www.answersincreation.org), to intermediate Creationist (e.g. http://www.reasons.org), to theistic evolution, which attempts to reconcile evolution to the text of the Bible basically suggesting that shouldn’t take its first three chapters too literarily (and maybe a few others too while we’re at it). One thing I can say with some certainty is that the dividing line runs firmly between the biblical account of Creation and Darwin’s theory of Nature playing dice, and trying to fuse the two together doesn’t seem to satisfy anyone so far. And here I return to the book. The first reason I found it to be so interesting was that its claims were substantiated, with frequent and clear references to actual, peer-reviewed research papers and books. As a scientist, I like to know how you know what you know, and I was thus delighted for once to see a responsible, properly researched piece on the topic. Secondly, the book makes a very significant claim, one that most of those involved in the Creation/Evolution debate actually ignore (myself included). And that is that the Theory of Evolution originated not so much from empirical observation of data (as a normal scientific hypothesis), but rather as an attempt to answer theological concerns. Don’t panic. Darwin and his friends were no devout Christians. But it is naïve to think that the man set out on the Beagle to look at some birds at the Galapagos Islands and one day “it all just came together”. Nope – read his “(On) The Origin of Species” (6th edition, preferably) if you don’t believe me, and you’ll find him often doing something that few scientists have the maturity to do: Tell his readers how his theory could “be taken apart” (e.g. in the context of incomplete fossil record). It doesn’t mean that Darwin didn’t believe his own ideas. But it does mean that the conclusions he penned down were not purely the result of what we’d call today “scientific observation”. In his book, Hunter suggests that Darwin’s thinking sailed on a stream of theological angst that was trying, essentially, to separate God altogether from the physical world. Hunter names this “theological naturalism”, and, in my opinion, he’s right. Hunter finds the origins of theological naturalism in the works of Thomas Burnet (d. 1715), but admits that even those have roots in the thinking of Immanuel Kant, who promoted the slicing between the “Noumenal and Phenomenal” realms. The general idea went something like this: The world as we perceive it is imperfect, asymmetrical, and laden with pain and destruction; thus to assume that God was and is intimately involved in its creation and maintenance is blasphemy, since God is perfect; thus it is better to understand that God merely created the natural laws under which the entire universe and all of life came to be, quasi-randomly. Now, keep going a bit further on this line of logic and you’ll arrive to that cliché of today, propagated by a certain Oxford professor: “God doesn’t exist because we don’t need Him to explain the world”. Hunter’s point is that it is grossly mistaken to assume that the Theory of Evolution is mere science as opposed to something requiring a degree of “faith”. In fact, I can’t help but think that Richard Dawkins would find this interesting, given his absurd position (of many) that scientists cannot be religious and that evolution is somehow definitive proof that God “probably” doesn’t exist (and people ask me why we call it “new” atheism). In any event, Hunter’s is an interesting view, and I think it’s worth our attention. If anything, it very accurately explains the virtually religious dogmatism and fanaticism of evolutionists today: It’s not just science. It began with religious concerns and it is constantly pushed, changed, re-changed, modified and evolved even in the face of significant evidence (of which the book gives a good overview). Despite its 170 pages, Science’s Blind Spot is not an easy read. The writing is often dry and reads like a PhD thesis – not a problem for this kind of subject material, but it certainly doesn’t make the book engaging to a wider audience. It could really benefit from an extensive re-write, expanding and emphasising the key points. Having said that, the constant repetition of those points makes them stick and provoke some thinking outside of the traditional Creation/Evolution debate box. And although it seems targeted mostly to scientists and those literate in the debate, I think there is much in there that many on both sides would find beneficial. I realise that this isn’t a comprehensive review, and after reading this post I find that it’s not as coherent and informative as I’d like it to be, so I hope you’ll forgive me for that. The Creation/Evolution debate is a huge topic with ramifications on many levels. Here, motivated by Hunter’s interesting and thought-provoking book, I just wanted to share some thoughts on the subject in the hope that you’ll find something helpful in there. This entry was posted in Origins debate, Reviews, Science/Religion. Bookmark the permalink. Thanks Richard!It feels strange to see my scribblings (or “keyboardings”?) looking so professional on LabLit – makes me feel like a REAL writer!Well, these issues have been occupying my mind a lot too, both as a scientist and as a Christian, and I’m always glad to meet others who are interested in the discussion.If you’re looking for a good resource to “feed the fire”, along with the book mentioned in this article, I strongly recommend “God’s Undertaker: Has Science Buried God?” by Oxford mathematician John Lennox, which I’m currently reading. Definitely something that has to be brought on the table. Hopefully, I’ll be reviewing it soon on the Microscope.